Charlie Chaplin was more than the actor we remember him as. He was a filmmaker too, and he produced and directed most of his own films. Charlie Chaplin, U.S. Gold and Canvas Software’s tribute to the silent film icon, puts you in his shoes on both sides of the camera. 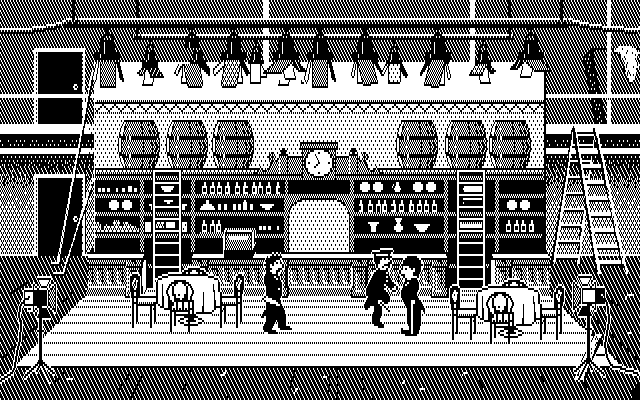 It’s a loving imitation of Chaplin, though the developers couldn’t figure out the right way to translate his style of comedy into a game, which has a ripple effect on the story about Chaplin it tries to tell. As Charlie Chaplin the producer, your job is to pick new film projects that could turn a profit, then use that money to bankroll your next movies. The game has a handful of scripts to sign onto, some real (City Lights, A Dog’s Life) and others (A Life on the Ocean Wave) that I could’ve been fooled into thinking were actual Chaplin movies. Then you take on the role of Charlie Chaplin the performer, and you act out the movies’ antics in front of the camera and hope the audience loves what they see. To a limited extent, this is a game about the movie business. You manage the studio’s finances, but it doesn’t comprise a big part of the game. More than anything else, Charlie Chaplin is a ode to the early years of film and the trials of film production. When you play as Chaplin, you’re on a film set, with lights and production equipment visible past the edge of the backdrops. Any objects on the set are listed on the prop sheet for each scene before you start filming. 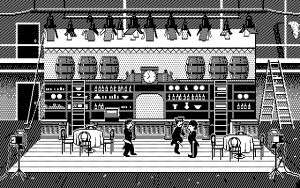 There are a small number of sets to shoot on – a bar, a house, a street, and so on – a restriction of film studio resources in the same way it was probably a smart restriction of the game’s budget. It’s unclear what you’re actually supposed to do once you’re in front of the camera. The game’s one-page manual (according to what’s available online) doesn’t offer up much detail. Two characters will be chasing Charlie Chaplin around the set, and based on the few options available, you can either kick them or kiss them, depending on who it is. 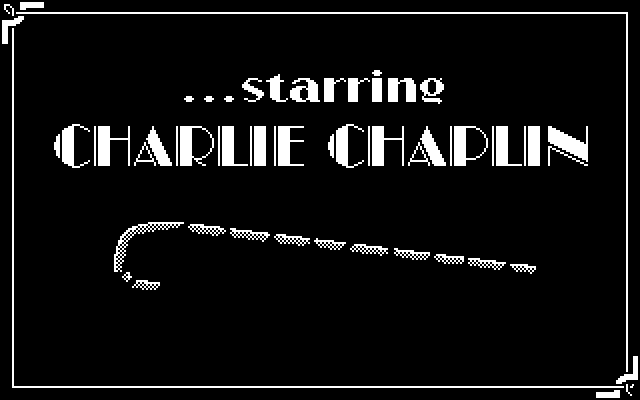 The game has a reverence for the silent film era, but it’s an unintentionally biting joke to reduce Chaplin films down to people getting kicked in the shins or kissed. As much as the acting part of the game can be repetitive and confusing, when my movie finally premiered to a packed theater, I couldn’t help but enjoy it. I genuinely laughed at seeing Charlie Chaplin get punched in the face. The fluid character animations are inherently funny, and the police offers twirling their batons are great foils for Chaplin’s mischievous Tramp character. The finished movie has an old-timey soundtrack, and the frame is trimmed just enough to hide the boundaries of the set and show only the action. There’s magic in seeing the final touches of production turn the raw film into something entertaining. Every single time, the audience hated it. I tried Charlie Chaplin several times and never had an audience like my movie. The requirements for a successful movie are so vague that I couldn’t follow them even after becoming more familiar with the game. Should I kick more people or kiss more people? Nothing seemed to work, and I was guaranteed to lose money with every film and go bankrupt. The game accidentally ends up being a bleaker story of the silent era – the story of the washed-up film star, unable to figure out what audiences want, struggling to find investors for his next movie, and falling out of the spotlight.